If you’ve been looking for some basic furniture for your home, check out SmartDeco‘s eco-friendly creations. Founded in 2011, SmartDeco produces 100% recyclable furniture that is proudly made in the USA. 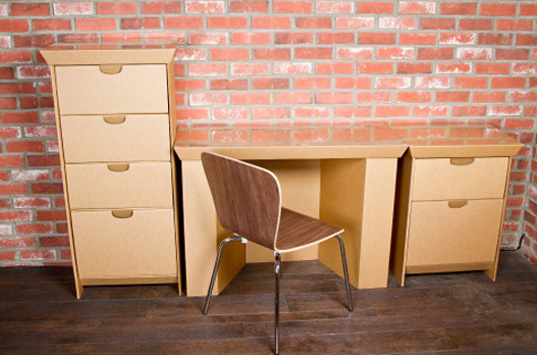 The furniture can be ordered online and it arrives flat-packed at your front door. Boasting tool-free assembly, each piece folds together intuitively in just minutes. Each piece in the collection is made using EnviroBoard, an affordable and eco-friendly alternative to traditional furniture substrates. If you've been looking for some basic furniture for your home, check out SmartDeco's eco-friendly creations. Founded in 2011, SmartDeco produces 100% recyclable furniture that is proudly made in the USA. The furniture can be ordered online and it arrives flat-packed at your front door. Boasting tool-free assembly, each piece folds together intuitively in just minutes. Each piece in the collection is made using EnviroBoard, an affordable and eco-friendly alternative to traditional furniture substrates.